Throughout late summer and early fall, the Liondale Farm's 20 acres of sunflowers became a must-see for hundreds of visitors who flocked to the site. 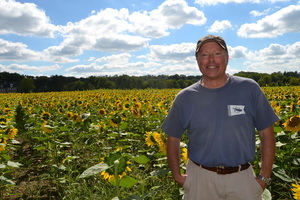 When a 20-acre portion of the 300-acre Liondale Farm in Unionville was dedicated to be a field of sunflowers earlier this year, owner Jim Sinclair and his wife Ann had no idea that their meadow of yellow would become a stunning pilgrimage for thousands of visitors. Throughout August and September, at any time, Sinclair said that there were seven to 15 cars parked along the farm's Route 926 main entrance. Still other cars entered down the road. For whatever their reasons, visitors from nearly every state in the Mid-Atlantic region stopped by to admire the gentle sway of sunflowers that seemed to go on forever. Many people took photographs or let their children run in the pasture; while others simply stopped to admire the view, but whatever the purpose, the word quickly spread. James Sinclair of the Liondale Farm. Sinclair said that crops are rotated every year, and for the next two growing seasons, corn will be planted and harvested, followed by soybeans and winter wheat. Sunflowers are not expected to be planted again until four years from now, he said. For Sinclair, who has lived at the farm for the last 14 years and is the eighth generation in his family to have done so, opening up a portion of his farm to admirers has connected thousands of visitors to the beauty of nature. “This field makes us realize the fact that we can own a property here, and allow people the freedom to come here from so many different parts of the country, simply to enjoy this,” he said.